Jocelyne Dawn Marie Larocque (born May 19, 1988) is a Canadian ice hockey player for Markham Thunder and the Canada women's national ice hockey team and a former defencemen with the University of Minnesota Duluth Bulldogs. With the Bulldogs, she was a two-time NCAA Division I national champion (2008, 2010). She is of Métis heritage and the first indigenous female athlete to participate in hockey in the Winter Olympics. Larocque played hockey and basketball from 2002 to 2004 at College Lorette Collegiate in Manitoba. During the 2003–04 season, she became the first female to appear in the Winnipeg High School Boys League. Larocque attended the Hockey Manitoba Program of Excellence Camp from June 25 to 27, 2004. Larocque competed for Manitoba at the 2003 Esso Women's Nationals in Saskatoon as the Manitoba team finished eighth. In January 2005, she was a member of the Manitoba team that participated at the Canadian National Women's Under-18 Championship in Salmon Arm, B.C. Manitoba finished fifth, but Larocque was honoured as Top Defenceman. She won the WWHL championship with the Calgary Oval X-Treme in 2005. In March 2008, Larocque had one assist as UMD won their fourth NCAA national championship in a 4–0 win over the University of Wisconsin. She competed along with two other players from her hometown of Ste. Anne, Manitoba (population 1,500.) Larocque, Minnesota Golden Gophers senior captain Melanie Gagnon and Mercyhurst forward Bailey Bram were known colloquially as the Ste. Anne Three. Also in 2009, Larocque was the first Bulldog defenceman to be named to the All-American first team. After being cut from Team Canada's Olympic roster in December 2009, Larocque elected to return to UMD for the second half of the 2009–10 season, forfeiting half a season of NCAA eligibility. On March 22, 2010, Larocque and the Bulldogs earned their fifth NCAA national championship with a 3–2 triple overtime victory over Cornell University. In a February 12, 2011 game against the Ohio State Buckeyes, Larocque had a goal and three assists as the Bulldogs defeated Ohio State by a 5–1 mark. Already the all-time top-scoring defenceman in UMD history, she became UMD's 14th player and first defenceman to score 100 career points. Larocque's assist on a power play goal with 40 seconds remaining was her second career four-point game. Larocque was the top-scoring defenceman in the WCHA for the 2010–11 season with six goals and 18 assists for 24 points in 26 league contests. In post-season league honours, Larocque was named to the All-WCHA first team; was voted the WCHA Defensive Player of the Year in a vote of the league's head coaches; was the top-scoring defenceman in the league with six goals, 18 assists and 24 points in 26 league contests; was named the WCHA Outstanding Student Athlete of the Year; and was named to the 2010–11 All-WCHA Academic Team. She graduated with honors from UMD in 2011 with a Bachelor of Accounting degree. 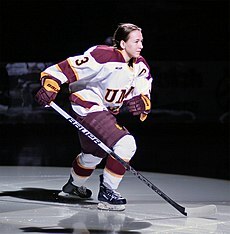 She ended her college hockey career as the Bulldogs' all-time leader in scoring for defencemen with 105 points on 19 goals and 86 assists in 127 games. She participated in the Canadian National Team Fall Festival that ran from August 31 to September 9, 2007. She was an Air Canada Cup women's champion in 2005–06 and 2006–07. On November 27, 2009 Larocque and Brianne Jenner were released from Hockey Canada's centralized roster to determine the roster for the Vancouver 2010 Winter Games. Despite not qualifying for the roster competing at the 2010 Winter Olympics in Vancouver, she was named to the final roster for the 2010 MLP Cup Larocque had an assist in the semi-final of the 2010 MLP Cup. In addition, she attended the Hockey Canada Strength and Conditioning Camp in Calgary from May 25 to 30, 2010. In addition, Larocque competed with Canada at the 2010 Four Nations Cup and won a gold medal. Her Olympic debut with the national team came at the 2014 Sochi Olympics where Team Canada won the gold medal. She played in the 2018 Winter Olympics in Pyeongchang, South Korea, winning a silver medal with Team Canada. She received attention following the gold medal game for removing her silver medal immediately after it was presented to her, prompting a later reproach from an IIHF official. She issued an apology the following day, saying in part, "In the moment, I was disappointed with the outcome of the game and my emotions got the better of me. I meant no disrespect. It has been an honour to represent my country and win a medal for Canada. I'm proud of our team and proud to be counted among the Canadian athletes who have won medals at these games." Larocque was a member of the Calgary Inferno. In August 2013, she was traded to the Brampton Thunder for Bailey Bram. Former Gophers player and captain Melanie Gagnon is Larocque's cousin. A team was named after her at the 2007 Female Atom Hockey Festival presented by the Manitoba Moose on December 29, at the MTS Centre in Winnipeg. Larocque's sister, Chantal, has competed for Canada at the ISBHF World Championships. Both were also teammates on the now-defunct Calgary Oval X-Treme. ^ "On the Home Front". ^ "Indigenous athletes help Team Canada win silver medal in women's hockey | CBC News". Canadian Broadcasting Corporation. Retrieved June 20, 2018. ^ "Ste. Anne's power trio". ^ "Women's hockey: Bulldogs advance to Frozen Four". Duluth News Tribune. ^ "WCHA.com – Game Recaps". ^ "WCHA.com – WCHA Press Releases". ^ "UMD Bulldog Scores a Personal Hat Trick". University of Minnesota Duluth. ^ "Brianne Jenner, Jocelyne Larocque released from Canadian womens team". ^ "The Official Website of Hockey Canada". ^ "Rules are rules: After shunning silver, Jocelyne Larocque ordered to wear medal". The Globe and Mail. February 22, 2018. Archived from the original on February 22, 2018. ^ "Canadian Hockey Player Jocelyne Larocque Apologizes For Taking Off Silver Medal". Sports Illustrated. ^ "Calgary Inferno add Minnesota's Sarah Davis, 15 others in annual CWHL draft". calgaryherald.com. ^ "American Hockey Coaches Association". ^ "Ste. Anne's Jocelyne Larocque strikes gold". February 20, 2014. Retrieved February 22, 2018. ^ "Ice Hockey – Athlete Profile: Jocelyne LAROCQUE". Pyeongchang 2018 Olympic Winter Games. February 22, 2018. ^ Kaulbach, Heather (September 26, 2018). "Winners of the Tom Longboat 2018 National Awards Announced" (PDF). Aboriginal Sport Circle Press Release. Retrieved October 16, 2018. ^ Canoe inc. "Ste. Anne hat trick". canoe.com.